I’m just back from a three-day trip to Rioja, another eye-opening experience. It’s interesting how miserable everyone there is about the Spanish wine market – I’m afraid I’m going to have to use quite a lot of numbers to tell you about it. Although Rioja utterly dominates the Spanish wine scene, producing near enough 39% of every drop drunk in the country (their closest challenger, Ribero del Duero, musters a mere 8.9%), everyone seems very worried about their future. A decade ago their statistical dominance was even more impressive: back then Rioja produced 70% of all the wine sold in bars, cafes and restaurants; last year that was down to 52.2% “Nobody drinks wine any more,” one producer told me, and though this isn’t entirely true the numbers are certainly heading down – in the first seven months of this year the Spanish wine market dropped by 5.1% by volume, and 4.7% by value (and 2010 was hardly a classic year, having seen drops of 0.9% and a ghastly 7.7% by volume and value respectively, year on year). In particular, sales of white and rose wines from the area are collapsing. Muga’s rosado, the wine whose massive popularity within Spain put the family on the viticultural map, according to the current winemaker Jorge Muga, is now totally shunned, and 90% of it is exported. Particularly bizarre as it’s bright, crisp and very cheap – around €5 over there, and about £8 here (find it at Waitrose, The Wine Society and independents). Rioja Riservas are so untrendy that many winemakers only label them as such for the export market, and try to disguise them as more fashionable crianzas within Spain. In the circumstances it might seem sensible to put a bit of money into trying to change public opinion in Spain. Instead, with the local economy in crisis and the unemployment rate hitting 21.5%, they have given up on the Spaniards and will concentrate on convincing the rest of the world to buy all the stuff that’s now failing to sell to the locals. This has worked of late – in 2010, for example, while Spaniards turned their noses up at Rioja Reservas, their sales in the UK rocketed by 56%. But the US has been identified as “the market with the greatest growth potential”, having grown by 30% last year to leap from No5 to No3 in the list of the world’s top Rioja importers (now behind just league-leading Britain and Germany), and 36% of the region’s publicity budget will be spent there this year. For all the misery, global sales of Rioja were up 13% in 2010, an increase of 31 million litres. They sold, in total, 267,117,831 litres of the stuff. That’s a lot of wine, and more than 100,000,000 litres more than they sold a decade earlier, which in turn was nearly 60,000,000 litres more than they sold in 1990. That kind of growth can’t continue forever. I’ll post more about my trip in due course. 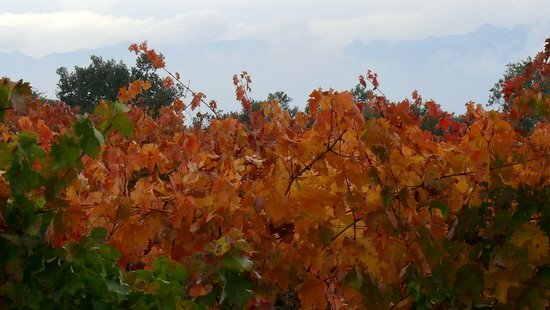 The picture at the top shows the view from the winery at La Emperatriz, interesting mostly because it shows the colour variation between the leaves of the region’s key grape varieties in the autumn. 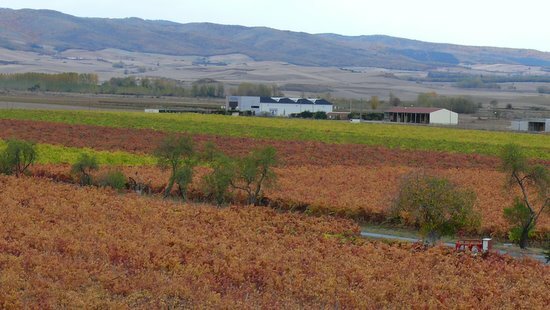 The rusty brown-red that dominates the scene and makes the area so dramatic at this time of year is tempranillo (more of which above), the patches of light green top left and far right are viura, Rioja’s key white grape, and the darker green bit is garnacha. I’m actually not entirely sure what the darker red bit is, but by process of elimination I suppose it can only be graciano (they don’t grow any mazuelo, or any other white grapes).